"An easy, date-filled cookie that's a big hit with my family all year 'round!" To prepare the filling, cook the dates, 3/4 cup of sugar and water over medium-high heat, stirring constantly, until thickened. Stir in the nuts, remove from the heat and set aside. In a medium bowl, cream together the butter and brown sugar. Stir in the eggs, sour cream and almond extract. Sift together the flour, salt, baking soda and cinnamon, stir into the creamed mixture. 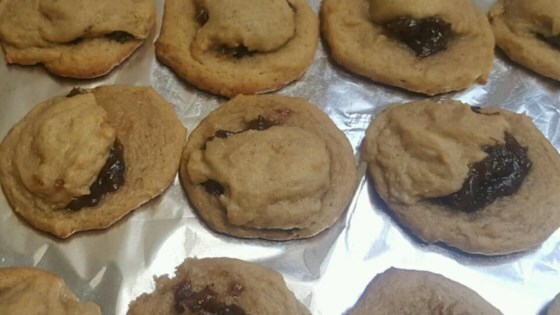 Drop a rounded teaspoon of dough onto an unprepared cookie sheet, place a scant teaspoon of the filling on top of it, then top with an additional 1/2 teaspoon of dough. Repeat with the rest of the dough. Bake for 10 to 12 minutes in the preheated oven, or until slightly browned. Bake delicious oatmeal cookies with white chocolate chips and cranberries.